This online e-filing and tax preparation service offers many options to prepare your tax return: Free Edition, Classic Edition, Premium Edition, Military Edition, Prior Year Tax Return, and Amended Tax Return. This is a user-friendly service and it makes most terms simpler so you don't require to know about advanced tax or accounting terminology for preparing your taxes. To get started, just go on the official page of the site, choose your desired program and start preparing tax return for free. Follow the directions and provide the required information in order to file your Tax Return. Getting through the e-filing procedure has been made very easy by TaxSlayer online tax service because you have to just fill the required info in boxes and click ‘continue’ or ‘cancel.’ It also provides the options to look for guidance or to go through the information on your own. For instance, if you want guidance about how to enter your income, you can choose ‘guide me through income’, and if you already know about it, you can choose ‘enter income myself’. TaxSlayer feels proud by providing the most comprehensive free file program that lets taxpayers to prepare, print, and e-file their Federal Tax Returns by using form 1040EZ for FREE!!! And the filing for State Return with this program will cost only $14.90 for first State, as well $4.95 for each additional State. However, if you do not meet these eligibility requirements for Free e-filing program, you can file your tax return using Classic or Premium e-filing program. Classic e-Filing Program offers the most price competitive online tax service by using which you can e-file your Federal tax return for only $9.95 & State return for only $4.95 per State. Here, you can prepare your Federal Return for free and after that you can e-file it by paying $9.95, only if you are completely satisfied. It provides the easiest and quickest way to prepare your taxes with simple menus and a new interface. This program is well priced and offers most of the aspects that we are seeking in an online tax service, including a refund and audit meter, an import tool, error checking, electronic filing, guided interviews, direct deposit for refunds and tax return status checks. This TaxSlayer version comprises all the great features of the Classic program; as well it includes a few new exciting features. You can e-file your Federal tax return for $19.95 & State return for only $4.95 per State. Here, you can prepare your Federal Return for free and then you can e-file it by paying $19.95, only after you completely satisfied. This program is intended for active-duty military personals; they can prepare and e-file both Federal and State tax returns for FREE! By using this feature you can create a return from up to three years past. 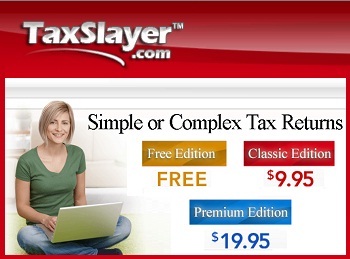 It allows you to access 2008 and 2009 program of TaxSlayer within the 2012 program. Here, you can prepare and mail your Prior Year Return at a cost of only $9.95. Now you can amend your tax return if you find an error after filing your tax return. TaxSlayer provides an Amended Tax Return e-Filing Program for this purpose. Here, you can prepare and mail your Amended Return at a cost of $19.95. This online tax service TaxSlayer also has the capability to handle rental and investment property, farm income and loss, small business taxes, retirement and foreign tax credits. Extra services include quick-start help and wizards, access to IRS publications through the tax-preparation interface, information about changes in tax law and an audit-risk meter. You can even use the federal refund calculator on the official page of the site to observe which types of forms are supported. This online tax service can support all major forms and schedules including 1040EZ, 1040A, 1040, Business Forms, Itemized Deductions, Rental Property, Tuition and Fees Deduction, etc. This tax service provides a help center which covers a range of tax topics including federal and state tax tips, some states specific information, answers for questions about military filing, as well as a helpful glossary containing definitions for more than 100 common tax words and phrases.